Welcome at restaurant NELIS Amsterdam West, a place where you can enjoy drinks and dinner. We open at 4pm and close when or last guests are ready to go to bed. On Friday, Saturday and Sunday we are open for lunch. Besides enjoying great food, honest hospitality can be experienced at our restaurant. Grab a seat at the bar for a beer with some friends, choose a quiet place to work or come in at night for a romantic dinner with your lover. Curious about our restaurant? At Nelis, you are more then welcome with larger groups. And don't forget, our terrace is ready for you from the first ray of sun! 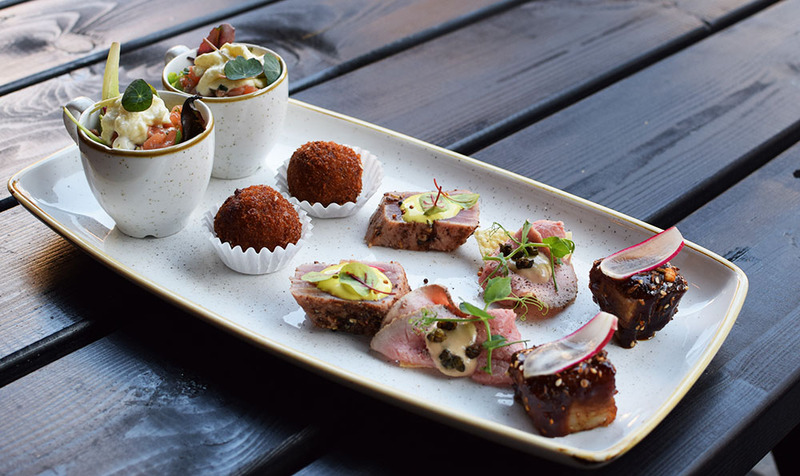 The chefs at restaurant NELIS Amsterdam West serve international dishes with a nice twist. At restaurant NELIS Amsterdam West, we are focussed on creating tasteful dishes as we believe that food tastes best when prepared with love and fresh ingredients. Come in for lunch, drinks or dinner! Choose your menu below or reserve a table. You can find our restaurant at Witte de Withplein, the square in the middle of the Witte de Withstraat. Close to the ‘Jan Eef’ and Edel. Public transport? Tram 17 and Bus 15 stop around the corner on the Postjesweg. On the Jan Evertsenstraat (stop Admiraal de Ruyterweg) you can find tram 19, tram 13 or bus 18. In the Baarsjes parking is paid until 00:00hrs, parking costs €2,40 per hour. On Sunday, parking is free! There are enough parking spaces in the area and there is a parking garage on the Mercator square, which is a 10 minute walk to restaurant NELIS Amsterdam West. Visiting us with 10 persons or more? Call or email us please! Restaurant NELIS Amsterdam West introduces the new spring menu. Chef Kees van Marle and his team have been inspired by the spring and proudly present new dishes to enjoy! Time is running out and every second counts! Will you succeed in discovering all the secrets? After the escape room you and your friends will enjoy a lovely dinner at restaurant NELIS Amsterdam West. An exiting and tasty adventure! Have you seen on our new menu? Yes! a Black Angus Bavette Steak (200 grams)! Our chefs roast it perfectly on cuisson for you! Order it tonight at Restaurant NELIS West and you will receive a free jar of Hertog Jan Grand Prestige ..
* The promotion only applies to the steak! quote HJGP & STEAK when reserving a table. Did you know……… That we provide NELIS gift cards? The most tasty present to give, or receive! Ask our staff for more information or send us an email if you wish to receive one at home.